Do you have the condition of excessive bleeding after the delivery? This is the condition of postpartum hemorrhage. Up to 4% of women experience postpartum hemorrhage and it more likely occurs with a cesarean birth. 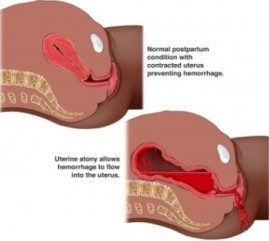 Usually, hemorrhage will occur before or after the placenta is delivered. In vaginal delivery, the amount of blood loss is about 500ml, but in cesarean birth, the amount of blood loss is 1,000ml. Most of the times postpartum hemorrhage occurs immediately after the delivery, but sometimes it can occur later also. Once after the delivery, the uterus continues to contract and expels the placenta. After the delivery of placenta, the uterine contractions help to compress the bleeding vessels at the region where the placenta was connected. If there are no proper uterine contractions, then the blood vessels will freely bleed and finally results in postpartum hemorrhage. If any minute pieces of placenta remain attached, then also bleeding continues. Multiple pregnancies: The condition in which more than one placenta exists and also over distension of your uterus. Over distended uterus: Too much enlargement of the uterus because of excessive amniotic fluid or baby with excess weight i.e. more than 4000 grams. 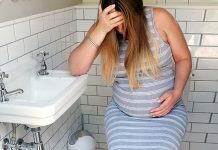 Pregnancy induced hypertension: The condition due to high blood pressure during your pregnancy. Placenta previa: The placenta is very near or totally covers the cervical opening. Potocin injection helps to prevent postpartum hemorrhage and helps the placenta come out quickly and easily. Some pediatricians recommend breastfeeding as soon as the birth of your baby. This condition allows you to secrete your own oxytocin to help contract the uterus and expel the placenta. Massaging of the uterus also help to expel the blood clots. Also, massaging is used to check the tone of the uterus and make sure that it is clamping down to stop excessive bleeding. Make sure that you take the help of relaxation and breathing techniques and don’t do exercises that cause excessive stress. If it is very painful, then you can also use medications. Ensure that your bladder is empty as this can help you in avoiding postpartum hemorrhage. In certain cases, surgery is also recommended to treat your condition. Typical surgeries include: hypogastric artery and ligation of the uterus. Both these surgeries can have repercussions on your fertility. Previous articleHow Serious Is Placental Abruption For You And Your Developing Baby?